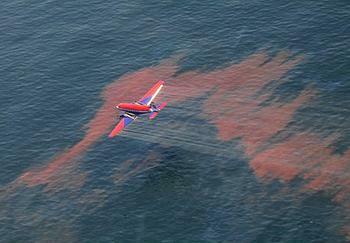 WASHINGTON, DC, August 7, 2012 (ENS) – A coalition of conservation, wildlife and public health groups in the Gulf of Mexico region and in Alaska filed a Clean Water Act lawsuit Monday to compel the U.S. EPA to issue a rule on oil dispersant chemicals. The groups contend that the EPA’s current rules do not satisfy the requirements of the Clean Water Act. They point to the the 2010 BP Deepwater Horizon oil spill in the Gulf of Mexico during which, they argue, dispersants applied to break up the millions of barrels of oil that gushed for three months from BP’s Macondo well were not used safely. During the BP Deepwater Horizon incident, some 1.84 million gallons of dispersants were applied to Gulf waters “with little knowledge or research into the chemicals’ impacts,” the plaintiff groups argue. Currently, regulations governing which dispersants are eligible for use in oil spills require minimal toxicity testing and no threshold for safety, they point out. The plaintiff groups point to a study published this week by the Dauphin Island Sea Lab and scientists from two Alabama universities, showing that the dispersants applied during the BP oil spill may have disrupted the food chain in the Gulf of Mexico, where commercial fishing provides food for the nation. “… dispersants cause marked changes in natural microbial communities in the Gulf, which disrupts the flow of energy at the base of the food chain,” the scientists wrote. They found that dispersants cause the disappearance of phytoplankton, microscopic plants that are the engines of marine food chains. Through photosynthesis these tiny plants provide energy for slightly larger animals called zooplankton, and for the small fish that feed on zooplankton. Public interest environmental law firm Earthjustice filed the lawsuit on behalf of the Louisiana Shrimp Association, Florida Wildlife Federation, Gulf Restoration Network, Louisiana Environmental Action Network, Alaska-based Cook Inletkeeper, Alaska Community Action on Toxics, Waterkeeper Alliance, and Sierra Club. Over 5,000 petitions have been sent by residents across the Gulf Coast region urging EPA to use its authority to initiate comprehensive testing of oil dispersants and to create regulations that include safety criteria and identify acceptable waters and quantities for use. But EPA has not created a new rule.